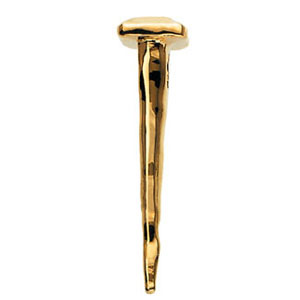 Brad Ferguson's large nail pendant is made of polished 14kt yellow gold. Item size: 1 1/2in x 3/8in. Weighs 3.85 DWT (5.99 grams). Please note: weight is approximate, actual weight may vary. Hidden bail, chain not included. Part of the Crown of Thorns collection by Brad Ferguson.